This 3-7/16" bore cylinder and piston kit can be used to build 84", 86", or 88" stroker engines, or the replace the cylinders and piston in an engine with an existing S&S® stock bore stroker kit. 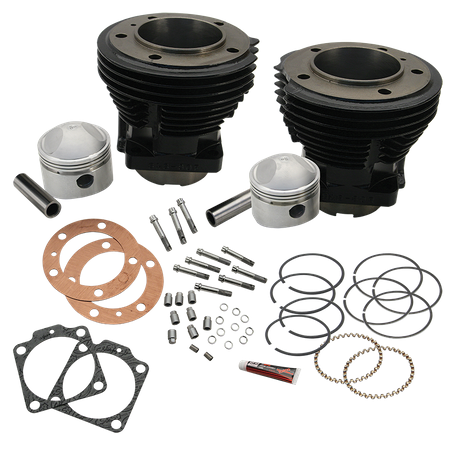 Kit includes S&S 3-7/16" bore high tensile cast iron cylinders, 3-7/16" bore forged stroker pistons with rings and wristpins, head gaskets, S&S stainless steel head bolts with washers, base nuts, base gaskets. This kit can be used in engines with 4-1/2", 4-5/8" or 4-3/4" stroke flywheels. Pistons in this kit are not intended to be used with stock flywheels. Very low compression and poor performance will result.